In case you haven’t heard, Fortnite: Battle Royale (Free) has taken the iOS gaming community by storm even in its current invite-only method of playing the game. This really shouldn’t be a surprise either, considering how well the game runs on current iOS devices, as well as how popular it has become on other platforms. When you fire up the mobile version of this awesome game for the first time, you’ll discover a few differences that may significantly alter how you play the game. We’ve been putting in our time and have a few words of wisdom to impart to try and make the transition easier for the rest of you. One of the cool changes to the mobile version of Fortnite is the inclusion of sound markers. When there are other people nearby that are running, the game will broadcast a movement sound marker on your HUD, which gives you both a general sense of direction and proximity to the nearby person. The same goes for when shots are fired, if you can hear them, your HUD will display both direct and general proximity. I can see why this was added to the mobile version as there may certainly be situations where you’re playing a game on your iOS device and you can’t have the sound on. Regardless if you’re in that situation or not, you should be using these sound markers to your advantage in every game. Pay attention to the loudness of the sound and compare to the marker on the screen so you can start to get a general idea of how close an enemy is when you see the visual sign. Keep in mind that your allies will show up as markers too, so if you’re playing with a squad keep in mind that the makers may not be as useful. Finally, these markers don’t help for players moving silently so stay alert regardless of what you see. Another change in the mobile version of Fortnite is the fact that the game will auto-unlock doors as you get close to them as well as automatically pick-up weapons and items if you have an empty slot. Generally, this is a pretty nifty feature as it saves taps on a small screen, but there are a few things to remember. First, if you end up with a full inventory and you want to swap out an item, equip the item you want to swap and then tap on the item on screen to do a swap. This is far more streamlined than opening the inventory screen, dropping the unwanted item and then trying to run over the item you do want. Unless you’re in the middle of a firefight, this is a serviceable option to manage inventory. Second, when it comes to auto-opening doors, remember that you can always close or open a door manually by tapping it on the screen. I’ve noticed though, that you can tell if a door has been opened and closed if you try to run into it and it doesn’t auto-open (at least in the games I’ve played). If such a scenario happens to you, beware because it might mean that someone has already been in there and may be laying a trap for you. If you’ve played Fortnite a lot on PC, one of the biggest transitions you may be trying to adjust to are the build controls. Sure, they are “good enough” for most build strategies, but if you think you’re going to be able to do some of those wild build-battles that you’ve seen on streams, well you’re going to have to practice quite a bit in order to get to that point. The one thing I will say though is that if you are playing on a mobile only match, most everyone will else will be in the same boat as you so you won’t have to worry too much about not being on a level playing field (if you’re on a cross platform match, though, all bets are off). Also don’t forget that when you’re in build mode, you have to touch an additional button on the top right of the screen to activate custom build mode, which lets you build walls with doors and the like. My recommendation would be to play a few matches where you just spend time as you can collecting resources and practicing builds, as it’s very possible to build competency once you memorize how to utilize the touch controls. Aim assist is another feature that is turned on by default for mobile users and is a stark contrast to PC. If you have it on and you let it, your crosshair will slowly track enemies in front of you with the goal of making it easier for you to follow, aim, and shoot your opponents. In my experience with aim assist, it’s more useful to have than not, but it’s a complicated relationship. What I like to do is use aim assist to snap to an enemy, but then I take control by making sure that I always have a finger on the screen that I’m using to fine-tune aiming the reticule. Furthermore, if I’m strafing, I’m moving with my left hand while simultaneously firing and aiming with my right. It sounds like a lot of coordination, but it’s not too bad once you get the hang of it. If you don’t need to move around, you can take your left finger off the virtual stick for movement, keep it on top of the dedicated firing button, and then use your right hand to aim as precisely as you can while firing. Mind you, these tips are for weapons without a scope — if you have a sniper rifle or something similar, aiming is a lot easier. By default, when you start a game, you will be playing with other mobile players unless you’re teamed up with a player that is not on mobile. At that point, you’ll be taken to the cross platform queue. One thing I’ve noticed very early on is the difficulty of players is much, much higher when you’re in a cross-platform battle. It makes sense too, as a keyboard and mouse (or even a controller) is a bit easier to play with than touch controls. This isn’t to say that you can’t own your own if you’ve been practicing for a while, but it’s certainly a hard pill to swallow early on. Also, you can tell if your teammates are playing on another platform if there’s an icon next to their name in the squad portion of the screen. Fortnite: Battle Royale, like a lot of the other games in the genre, takes a lot of practice to truly master. Just because you may be playing the game on mobile, doesn’t mean this mantra doesn’t apply to to it. 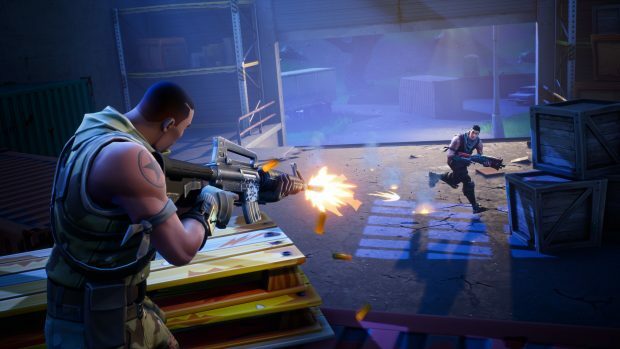 If you really want to get good at this version of Fortnite, you need to play whenever you can. Play games with the primary goal of testing out controls to the maximum extent possible. Start to memorize the locations of the touch buttons as well as the combination of taps needed to do whatever you want. Practice with the weapons you want to master and test different methods of aiming to decide which one you really want. Turn auto-aim on and off, test the differences, and decide which one makes most sense for you. Only have a few minutes? Play a quick match where you dive right into one of the hotlines on the map and practice combat skills. Got any more mobile-centric tips? Feel free to post in the comments. Otherwise, stick with us as we continue our coverage of one of the biggest titles to hit iOS in quite awhile.